Mary’s response to the message of God’s angel Gabriel shows the humility and submission of an earnest disciple of the Lord, “Mary said, ‘Behold, I am the servant of the Lord; let it be to me according to your word.” (Luke 1:38) She fully yields to the Lord’s word and the movement of the Holy Spirit in her life. Her cousin Elizabeth describes Mary as the “mother of my Lord” and as blessed because she believed the promises of the Lord. Discipleship begins and ends with grace from the Lord and belief from the disciple. Mary responds to Elizabeth’s interaction with her by proclaiming her “Song of Praise” that begins, “My soul magnifies the Lord, and my spirit rejoices in God my Savior.” (Luke 1:46-47) Mary consistently demonstrates the appropriate posture of the Lord’s disciple. She seeks to magnify and glorify the Lord, not herself, and her joy is in the Lord and not the world. Scripture describes Mary as marveling at what is said about Jesus. I imagine this describes a consistent response to Jesus’ life by his mother. From the announcement by Gabriel onward, she marvels and treasures mysteries in her heart, as she conceives, gives birth to and raises God’s son. As with any disciple of Jesus, her life includes wonderful glory and painful sorrow and trials. With Mary, these are much more extreme and felt more deeply than with others. Mary wasn’t perfect and surely worried and feared for her son, as most mother’s do. I wonder if like my mom (and wife) she exhorted Jesus to “Be careful!” each time he ventured out the door. How keenly her eye must have been on Jesus the toddler, the teenager, the young man and then the Prophet out in the world. Still, we see Mary’s family as being large and full of life and sibling dynamics. She was a mother to more than to Jesus, and she was nothing less than mother to Jesus. She is first and foremost Jesus’ mother. In a sense, she also had to drink the cup of God’s wrath. Actually, not “in a sense;” she did drink from that cup the Father gave to Jesus, as his sacrifice and suffering must have overwhelmed her being with pain and shuddering. Her letting go of Jesus for Jesus and for all people reveals the “greater love” of giving up one’s very life. At the dedication of Jesus at the Temple, the prophet Simeon proclaims to Mary that a “sword will pierce through your own soul also.” She knows Jesus through his entire life and follows him through his ministry to the cross. Can we even approach coming to terms with how Jesus must have honored and loved his mother during her lifetime? His devotion to his mother can only be equaled by her pain and sorrow at his death. There is the time recorded in the gospel when Mary accompanies her other children to go apparently help Jesus. Mark writes, “Then he went home, and the crowd gathered again, so that they could not even eat. And when his family heard it, they went out to seize him, for they were saying, “He is out of his mind.”” (Mark 3:20-21) His mother and his brothers came to “capture” him and take him home. I wonder if Mary is thinking and telling her other sons something like, “Look, He’s not out of his mind; he is God’s Son; he is the Messiah! He’s doing what he has to do.” Or, did Mary give in to that fleeting hope that maybe they could get him to come home and just stay and put this whole thing off a while. Mary walked through the heights of being the mother of the most wonderful person who ever did or ever will live. She experienced the sweetness of Jesus. At the cross, she descended into the bitterness of the valley of the shadow of death. Our discipleship may follow similar paths of sweetness and bitterness. I hope that we will be faithful to stand with and for Jesus, as Mary was faithful among all people. We will then be blessed, as she is blessed. I pray that our devotion to Jesus will honor his mother and make her glad. The reunion of the risen Christ with his mother Mary is not recorded in the Scriptures. I imagine this intimate event was so wonderful and joyful to be indescribable while also being a private celebration between a mother who smothers in loving embrace the son she thought she had lost. Had it been witnessed and reported by any of the gospel authors, it surely would have become the second time in the gospels that Jesus wept; although, this time his weeping would be tears of joy. What joy and gladness to heal Mary’s broken heart and turn her mourning to rejoicing! This hearkens back to Jesus’ birth when the angel appeared in great glory and declared to the shepherds, “A Savior who is Christ the Lord” has been born. Then heaven opened and the multitude of angels sang “Glory to God in the highest.” This glorious announcement of the Christ would seem to point to a prince being born in a king’s palace. Rather, the shepherds arrived at a manger and viewed this Christ, humble and poor with his parents, seemingly needy like us. Jesus’ triumphal entry into Jerusalem seems to be an event to precede a majestic enthronement of the Christ. It is easy for Christians to go from the Sunday of the Palms to Easter Sunday—from glory to glory, and avoid the road between; however, that is not the way of Jesus. Jesus’ birth, his triumphal entry, his journey in the flesh, occur on the way of the cross. The way of following Jesus leads to the cross. The meaningful relationships and accomplishments in our own lives often involve glorious events marking the way of the cross. Marriage begins with glory and has glorious moments, and it also includes the way of the cross of self-denial, dying to self, bearing with one another, commitment and submission. The glory of parenthood—the birth and the milestones, coincides with taking up one’s cross and sacrificing for the sake of others. Sports, careers, education, etc., can only lead to glorious moments as much as one follows the way of the cross of discipline and submission. Many of us Christians would say we know and understand what it means to be a Christian. “Of course, we know how to be a Christian!” we would say. I know how to play golf, too, “It’s easy…Tee up the ball and hit it until it is in the hole.” That hides the reality that I don’t know how to play golf well. I continue to play badly, but yes, I know how to play. We might describe being a Christian as getting saved by accepting Jesus, trying to live a good life and going to heaven when you die. That is true. The Christian life involves that. Like my description of golf, it doesn’t tell the whole story. We can know about the Christian life and even how to do it and not do it very well at all. I think the biggest reason for living the Christian life poorly is because we expect or demand to live from glory to glory yet resist and reject the way of the cross. Jesus says we simply cannot be his disciples apart from the way of the cross. We can be childish Christians refusing to mature in the faith. Like a child who picks up a guitar and strums the strings making noise who says, “Ha! I know how to play the guitar,” we play at being a Christian by avoiding the way of the cross. James Packer describes these as “innumerable converts who are existing in what seems a permanent baby stage – Christians who were never properly discipled and who spiritually have never grown up.” Packer praises the Lord for his unfathomable love and faithfulness by which he keeps such immature Christians safe in the world. Jesus’ life is bookmarked by a glorious birth announcement and a glorious resurrection; in between these is the way of the cross. It is Jesus’ death that speaks to the centurion at the cross who declares, “Truly this was the Son of God!” We know God’s Son, Jesus, will arises from death to great glory. Only the blood of the Lamb is what allows for this glorious scene. For Jesus, the triumphal entry to the resurrection and his exaltation in heaven was traversed only by the way of the cross. The road linking Palm Sunday, the triumphal entry, to Easter is the way of the cross. The journey from our baptism, the washing of repentance and the new birth in Christ, to our entrance into this great multitude before the throne of God in heaven is also the way of the cross. We live in the great tribulation of this fallen world. We will come out of it victorious by the blood of the Lamb and the word of our testimony that is the gospel of Jesus Christ. The way to victory in Christ is the way of the cross. As Christians, we are in Christ, and Christ is in us. He is our “hope of glory.” Paul writes, “thanks be to God, who in Christ always leads us in triumphal procession, and through us spreads the fragrance of the knowledge of him everywhere.” (2 Corinthians 2:14) We could misinterpret this as describing a life of glory and triumph and having all we want during a royal life. When we consider our lives, we can identify times of affliction that we survived. We have been perplexed, disillusioned and frustrated; life sometimes strikes us down. We go through trials, and the Christian life doesn’t exempt us from trouble. In the midst of all of these and on the way of the cross, we have victory through Jesus. We may be driven to despair; however, we don’t have to go there ever, because we have hope and salvation. It is a mystery to me why the apostles of the Lord suffered and most were martyred for their faith. I don’t understand why the Lord has allowed so many of his faithful followers in the early church to be killed for their faith. I am saddened for the Christians who have suffered under communist, Islamic and other oppressive regimes in my own lifetime. I am frustrated to hear of Christians in Syria, even children, who were tortured and killed for their faith during the month of this writing. I know this is the way of the cross; it is the way from glory to glory. It is the way of discipleship—to take up our cross, deny ourselves, lose our lives, following in the way of our Lord. I know it is for his glory and good purpose. A prayer from the Book of Common Prayer “collects” the calling of the Christians and the reliance on God’s grace, guidance and power. “Almighty God, whose most dear Son went not up to joy but first he suffered pain, and entered not into glory before he was crucified: Mercifully grant that we, walking in the way of the cross, may find it none other than the way of life and peace; through the same thy Son Jesus Christ our Lord.” Amen. The author John introduces the story of Jesus raising Lazarus by identifying Lazarus as the brother of Mary “who anointed the Lord with ointment and wiped his feet with her hair.” John has not yet given his readers the account of the anointing of Jesus by Mary; it actually follows in the next chapter. However, John wants his readers to know that this is “the Mary.” Perhaps they had heard of her devotion to Jesus. The early church may have already had its heroes of the faith. Upon the illness of their brother, the sisters Martha and Mary send a message to Jesus, “Lord, he whom you love it ill.” This phrase is similar to the way John describes himself as “the disciple Jesus whom Jesus loved.” (John 21:20) By this time in their relationship with Jesus, the women know that Jesus loves them and their brother. They also know that he is the healer and miracle worker, and they place their hopes in his response. They may have even calculated the time at which the healing would occur… “Let’s see; it should take a day for the message to get to Jesus and then about a minute for him to send the healing to Lazarus.” They waited. John’s audience sees the reaction of Jesus. He waits, too, but he knows. He walks by the light of God, and God is orchestrating the events for his glory and so that people would believe. John’s entire gospel is written, so that people might believe and have life in his name. (John 20:30-31) Through his historical narrative, John will illustrate to his audience the passion, power and purpose of Jesus. Jesus’ disciples with him don’t know either. They warn him that he is entering an area of opposition that may even lead to his death. Thomas speaks up and says, “Let us also go, that we may die with him.” We cannot determine whether this is inspired by courage or surrender. What we see in this historical event narrated by John is that nobody knows what Jesus is doing—not his disciples, not his friends, not the villagers. Each person has his or her image of Jesus, who he is and what he is doing, and some are nearer the truth than others. Knowing Jesus begins and ends with clinging to him, trusting him and loving him. We cling to Jesus, so that we can keep our eyes on him and learn of him. We trust him because he is the Good Shepherd leading us to abundant life. We love him because he has first loved us and continues to lavish his love upon us and others. We cannot, however, figure him out. In the midst of the story, Jesus gets to the point with Martha, “Do you believe this?” Do you, today, believe this? In the midst of your story, do you believe that by faith in Jesus you have eternal life and shall never spiritually die? Martha is then sent to Mary. Listen to her message to Mary, “The Teacher is here and is calling for you.” Jesus calls for Mary. While she has been wondering where Jesus is and calling for him, he comes and calls for her. Mary is on Jesus’ mind. We, his children, are on Jesus’ mind. Jesus doesn’t act according to our dictates or egos’ desires, but we are on his mind. He is working, so that we might believe and receive life to his Father’s glory. What a wonder?! This is Jesus’ purpose. Mary goes to Jesus quickly and immediately. How do you respond when Jesus calls? How do you respond to knowing that you are on his mind. Mary comes to Jesus and falls at his feet. This is a posture of worship and possibly exasperation. At the feet of Jesus is an appropriate place for either. He is worthy of our worship and competent to handle our exasperation. “When Jesus saw her weeping, and the Jews who had come with her also weeping, he was deeply moved in his spirit and greatly troubled,” and, “He wept.” Jesus loves this woman weeping at his feet pouring out her heart to him. He becomes deeply moved by her. He is deeply troubled by the presence of sin, death and sorrow in this world that was made through him for his Father’s glory. He has come to overcome these evils. It has not been in stoicism or with a robotic response that Jesus has come from heaven. Jesus loves deeply and hurts deeply. He has come for an eternal purpose. His passion and power are demonstrated in fulfilling his purpose. When Jesus comes to the tomb, he is “deeply moved again.” This is the passion of the King of Kings and Lord of Lords who will come with earthquakes, thunder and lightning. He is the one whose passion will cause the stars to fall from the sky and the entire old order of things to pass away to make room for the new heavens and new earth. He has come to conquer sin, Satan and death for the glory of God and to give eternal life to all who believe. Martha’s protests are firmly rebuked by Jesus, “Did I not tell you that if you believed you would see the glory of God?” Sometimes rather than follow Jesus up a mountain to see the glory of God we are asked by God to merely wait in faith. We wait in faith by staying close to him and his promises. We keep our eyes on him looking for him to come. We keep our ears open to his words listening for his voice. We continue in the fellowship of the saints surrounded by the “cloud of witnesses” and worshipping God with our fellow servants the angels. And we wait for the door of heaven to be opened into our lives. God hears us, as he heard Jesus offering prayers while he was on the earth. God answers our prayers, so that we and those around us may believe in Jesus. After commanding people to take the stone away, Jesus calls Lazarus forth from death back to life, restores his body to health and returns him to his family and the world. The one whom Jesus loves is with Jesus again. Jesus, the resurrection and the life, has come and all is well. We cannot minimize or dismiss the anguish that Mary and Martha endured for the four days of their brother’s death. In his sovereignty and love, God not only allowed it but brought it about for a higher and better, eternal purpose. Jesus did not exempt himself from their anguish; he entered it and experienced their pain and sorrow himself. If Jesus does not seem to be present or acting according to your expectations, do not fear, doubt or become angry. He is present, and he has taken in your pain, sorrow and fervent pleas. He sees the victory and will bring the revelation of God’s glorious workings. Mary and Martha learned that with Jesus their mourning may last a period of time but rejoicing is sure to come. Faith in Jesus leads to rejoicing and life. All of Scripture prophetically proclaims the coming glory of God. If we believe, we can rejoice now at the assurance of Jesus’ coming. The message of Revelation encourages readers to have “patient endurance” in light of their trials and the certain coming of their Savior and King to make “all things new.” The strength, faith, patience, endurance and assurance comes only from Jesus and our intimacy with him. 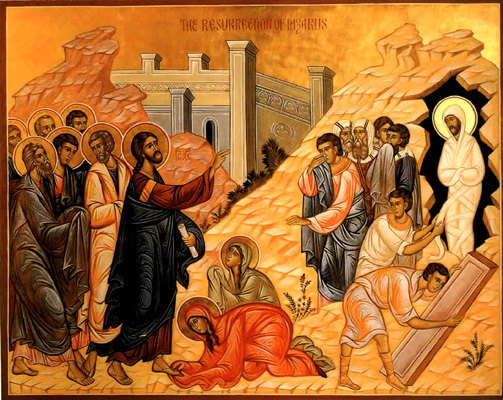 The story of Lazarus, if it teaches us anything, teaches us to keep the faith in Jesus, even against all odds, even against the reality of the burial stone placed before the tomb. We live in a fallen world in which even “the one Jesus loves” can suffer in pain or trouble, even to the point of an untimely death. We may face severe anguish and mourning in our lives. In all of these things, Jesus comes in passion, in power and with purpose. He comes so that you might believe and have life. If the Lazarus story shows what Jesus can do with a person dead four days and hidden away in a tomb, what can he do with you when you place your life in his hands? He is passionate for you. He has demonstrated his willingness to use his power to fulfill God’s purpose in your life. If you put your life in God’s hands, you are sure to see God’s hands in your life.